Volunteering as a youth football coach can be a great experience, both for you and your squad. But what if you've never coached before, or want to improve? Don't worry! This friendly guide explains football rules, shows you how to approach coaching, and gives you practical pointers on improving team skills and encouraging good sportsmanship. The National Alliance For Youth Sports has been America’s leading advocate for positive and safe sports for children for the past 25 years. It serves volunteer coaches, parents with children involved in organized sports, game officials, youth sports administrators, league directors, and the youngsters who participate in organised sport. The Alliance’s programmes are used in more than 3,000 communities across the USA by parks and recreation departments, Boys & Girls Clubs, Police Athletic Leagues, YMCAs/YWCAs, and various independent youth service groups, as well as on military installations worldwide. For more information on the Alliance’s programmes visit www.nays.org. Greg Bach is the communications director for the National Alliance For Youth Sports, a position he has held since 1993. Before joining NAYS, he worked as the sports editor of the Huron Daily Tribune in Bad Axe, Michigan, where he captured numerous writing awards from the Associated Press, Michigan Press Association, and the Hearst Corporation. He has a journalism degree from Michigan State University, which he earned in 1989. He’s an avid sport fan and has coached a variety of youth sports. James Heller has been involved in football on and off for over 35 years. As a player, he played from youth-team level through into senior football. He has also helped to coach and manage football teams at several different age levels. In his time associated with ‘the beautiful game’ he has seen junior football coaching in the UK improve from a situation where 20 children ran around a muddy park aimlessly chasing the ball, watched by two cold goalkeepers, to one where the focus is on mini-soccer, skills improvement, and ‘one child, one ball’ training sessions. Part I: Getting Started Coaching Football. 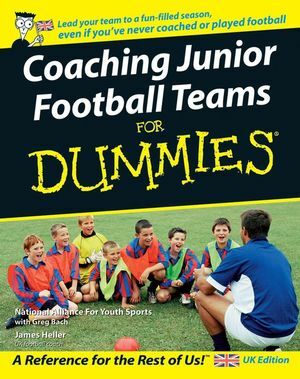 Chapter 1: Coaching Children in Football. Chapter 3: Knowing the Football Basics. Chapter 6: Running a Great Training Session. Part III: Beginning and Intermediate Football. Chapter 9: Mastering the Fundamentals. Chapter 10: Fundamental Drills for a New Team. Chapter 11: Coaching Basic Attacking. Chapter 12: Coaching Basic Defending. Chapter 13: Taking It Up a Notch: Drills. Chapter 14: Upgrading Attacking Tactics and Skills. Chapter 15: Advanced Defending and Formations. Chapter 16: Coaching Set Pieces. Chapter 17: Implementing Advanced Exercises. Part V: The Finer Details. Chapter 18: Keeping Kids Injury Free and Healthy. Chapter 19: Challenges Every Coach Faces. Chapter 20: Getting More Competitive. Chapter 22: Ten Fun Ways to End on a High Note. Chapter 23: Ten Recommended Resources and Organisations.